It is critical for diabetics to develop a lifestyle plan that controls blood sugar (glucose levels), manages weight and protects against heart disease, such as high blood pressure and high blood fats. A great way to do this is by sticking to a daily routine with scheduled meal times. You need to eat every three to four hours to keep your blood sugar balanced. For example, eat breakfast at 7 a.m., have a morning snack around 10 a.m., lunch at noon, an afternoon snack around 4 p.m. and dinner around 7 p.m. Find a schedule that complements your lifestyle. For instance, if you eat a later breakfast, you will not need to incorporate a morning snack. Down the road if your schedule changes adjust accordingly. It only takes your body 21 days to develop a new habit. Speaking of snacking, choose a lean source of protein (1-2 tablespoons unsweetened nut butter, string cheese, 2-3 slices of turkey, hardboiled egg, ¼ cup hummus, or 8-10 raw nuts) and pair it with a fruit, vegetable or whole-grain. The combination of protein and fiber (which is critical to keep high for diabetics) will give you energy and keep your blood sugar stabilized. For example, a handful of pretzels or an orange will not sustain you, but 2 Wasa crackers with turkey slices or a piece of string cheese with a sliced apple or ¼ cup hummus with raw veggies, will keep you satisfied until your next meal. Please note: When selecting your protein component choose lean sources like chicken breast, turkey breast, fish, bison, grass-fed lean cuts of meat and beans. You also want to practice portion control to keep your weight in check. A great way to do this is by measuring your food until you learn to eyeball it. This can easily be done with some measuring cups, spoons and a kitchen scale. Companies also make portion control kits for convenience. For example, a serving of whole-grains (brown rice, quinoa, whole-grain pasta) is a ½ cup (or 1 slice of whole-grain bread), not an entire plate. Instead continue filling it with lean protein (3-4 oz. for women, 6 oz. for men) and lots of non-starchy vegetables (broccoli, asparagus, leafy greens, bell peppers). Ideally, half of your plate should be colored with veggies! Additionally, include healthy fats in moderation. Monounsaturated fats (olive oil, avocados, nuts) and polyunsaturated fats (Omega-6 and Omega-3) have a positive effect on your health. 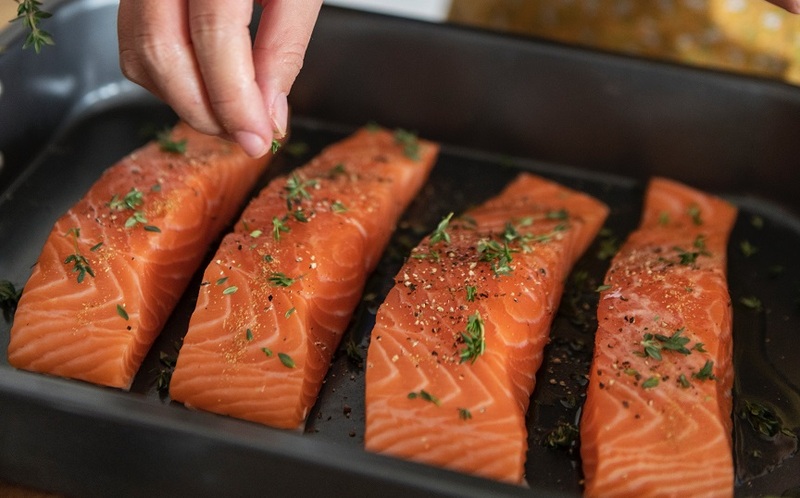 Omega-6 (sunflower oil, corn oil, safflower oil) and Omega-3 (salmon, flax seeds, walnuts) fats are extremely beneficial in preventing and reducing systems associated with diabetes, cardiovascular disease and inflammation. Plus they taste yummy, making your meals more satisfying and balanced. Finally, make sure to read food labels carefully at the grocery store. Many food companies occasionally market high-sugary foods as “healthy.” For instance, it is best to buy unsweetened Greek yogurt and add in your own fruit. Sugar naturally occurs in lactose so nonfat Greek yogurt has approximately 6 grams of naturally occurring sugar. Many brands of low-fat yogurt, however, contain added sugar. A nonfat strawberry yogurt may contain up to 18 grams of sugar. This means there is an extra 12 grams of added sugar. Lastly, food companies have many different names for sugar (evaporated cane juice, barley malt, brown rice syrup, high fructose corn syrup). They will then divide up the sugar component into several names on the packaging label. For instance, many seemingly healthy energy and granola bars are labeled as such. But will a little patience you can become an expert consumer in no time.